With rich industry experience, we are manufacturing and supplying a wide assortment of Camping Tents. NOTE - BUYERS PLEASE NOTE THAT THE COLOURS SHOWN ARE FOR INDICATIVE PURPOSES ONLY AND ACTUAL COLOURS OF THE PRODUCT MAY BE DIFFERENT AS PER AVAILIBILITY. - Spacious interior, room to move, freedom entry or exit. - Standard Size, 4m x 4m x 2.5m Ht. (13' x 13' x 8ft Ht)Side wall Height of 51/2ft. & center Height of 8ft. - Comes with all accessories such pegs, ropes, etc. - All ready to install. 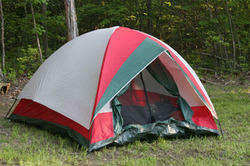 Being one of the well-distinguished companies in the market, we are offering Outdoor Camping Tent. Weather Junction is one of the most recognized name engaged in offering a variety of Camping Tent which are draped over or attached to a frame of poles and ropes. 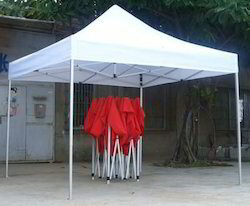 We manufacture all kinds of Tents such as Labour Tent, Picnic & Camp Tent. Tents are hemmed with strong jute rope in all sides, fixed alluminium/HDPE eyelets. We provide runner rope to tie with wooden pegs. We can also supply tents as specified by customers.